It was quite a few months ago now when I discovered the splendors of the Missouri Star Quilt Company. My quilty Grammom had been nagging me for what felt like decades to check it out, but being the procrastinator that I am…I kept putting it off. Then one day a quilty friend posted a particularly spectacular "Daily Deal" on Instagram that prompted me to finally give in and check out the site. Now it's official. I'm a convert. From what? I don't exactly know. What I do know is that the first thing I do when I wake up in the morning is grab my iPad off of the bedside table and go straight to the Daily Deal. It's always exciting to see what marvelous pre-cut fabric or new-fangled change-your-life quilty tool is available at a steal-of-a-deal price. And then there are Jenny's fun tutorials. I love how she comes up with so many great ideas and shortcuts to make things quicker and easier. Because let's be honest…there are only so many hours in a day and days in a lifetime. 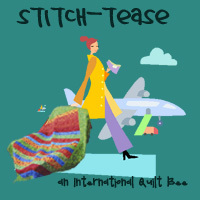 I'll never have enough time in my life to stitch up all the things I want, so shortcuts are like tiny little victories. Also, Jenny's videos are presented with lots of smiles and usually a couple jokes, which makes them even more fun to watch. When I saw the MSQC video for Iron Quilter 2 a couple months ago, first I laughed out loud; then I thought what fun it would be to participate. 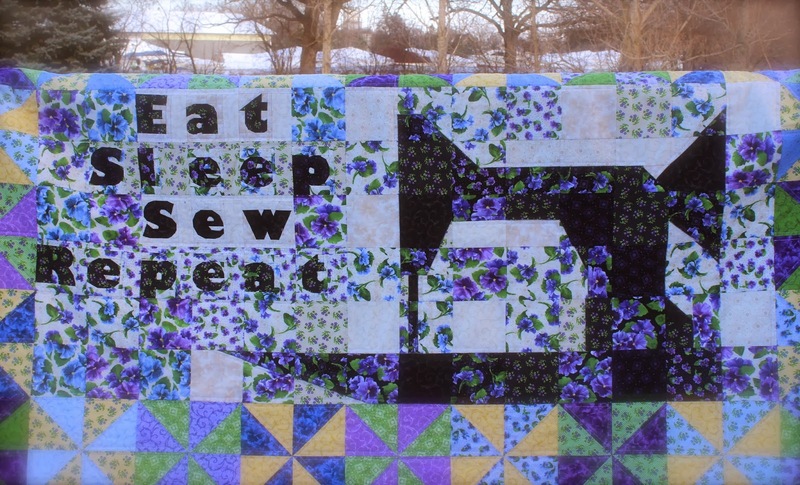 I've never entered any kind of quilting competition before, so I thought, "What the heck? I'll give it a go." I had an idea immediately and set to work with my graph paper. When the secret ingredient "Lovely" charm packs arrived, I had fun sorting through them and seeing all the pretty prints. I was happy that I had started work on the project early. There was plenty of time to put together what I had in mind. Then a couple months rolled on by. I can't remember exactly when I got the fabric in the mail, but long story short: I finished with precisely one day to spare. You know how sometimes life gets in the way of what really matters? (i.e. : quilting) Isn't that annoying? Ugh! 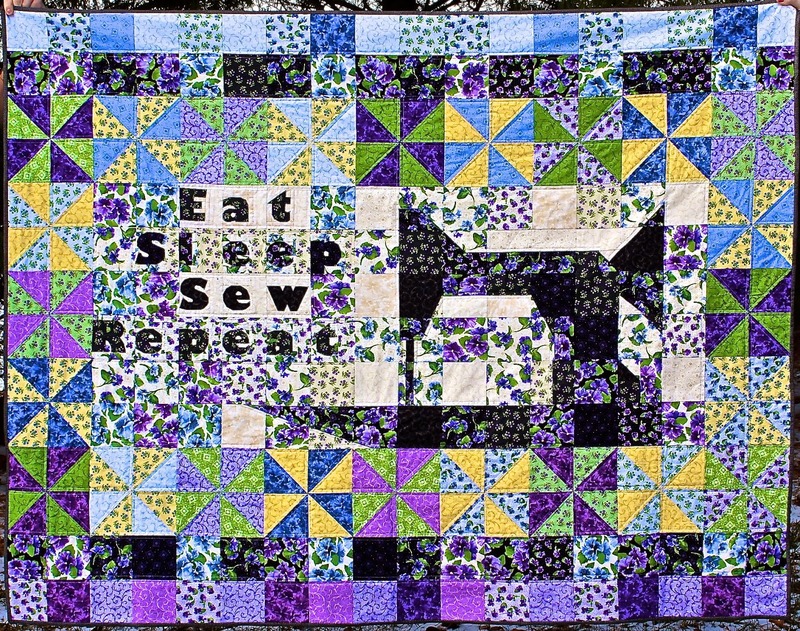 Eat, Sleep, Sew, Repeat = Story of my Life!! In hindsight, I wish I would've added some solids to break up the busy. I think the words are easy enough to see, but I hope you can all pick out my rendition of a Singer Featherweight. I used Diane Bohn's paper pieced alphabet pattern for the letters, but the Featherweight was all my own sketching and improv piecing. 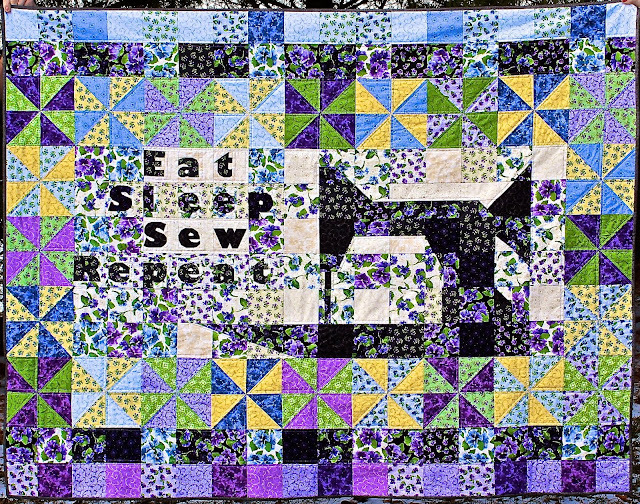 The quilt top is made entirely with Lovely charm packs. 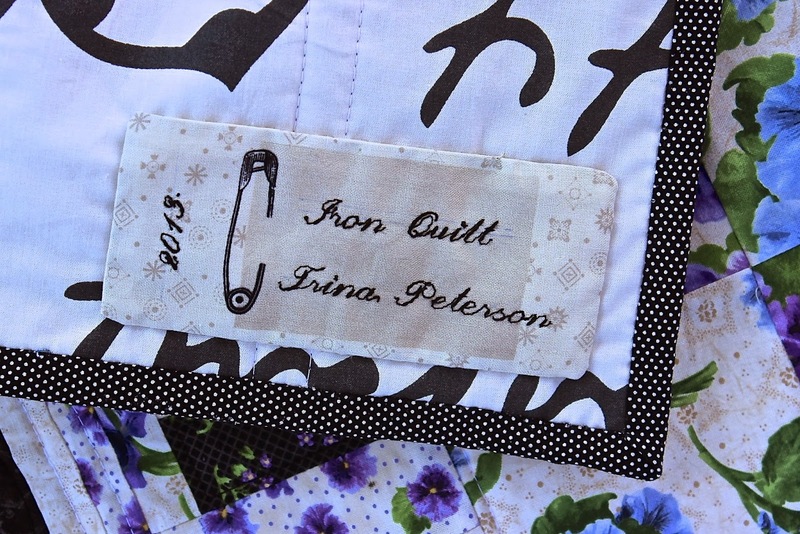 I quilt everything myself. For this quilt I did 1/4" offset straight lines on my trusty Juki 2010Q. The finished size is about 72" x 56". Judging for the Iron Quilter 2 competition will be done by the general public via a Google+ album by MSQC. Photos will be displayed and each +1 = 1 vote. I'll go ahead and play the politician: "Vote for me and all of your wildest dreams will come true!" But even if you don't vote for me, I hope you'll check out the pictures. It will be fun to see what everyone put together using the secret ingredient. If you're new to Google+, you need a free google email (gmail) account to vote. You can sign into your gmail account when you go to the album and then you will be able to vote (+1) your favorite entries. You also may submit comments, but they don't count as votes.